I’m a big fan of the NHHS rail project, which promises to connect New Haven, Hartford, and Springfield with (more) frequent commuter rail service beginning in 2016. The project’s promotional materials have heavily promoted the corridor’s transit-oriented development (TOD) potential, promising to concentrate development in areas around stations all along the line. That’s a promising tack in Connecticut, which suffers from sprawl and has significant available urban land for development (with the possible exception of New Haven), but now I’m wondering about the commitment of project managers and state and local governments to true TOD. Just so that we’re clear, the tweet juxtaposes the hashtag #TOD with a promise to build a parking lot—a parking lot!—immediately adjacent to the to-be-rebuilt Meriden station. Let’s just be very clear—under no circumstances does placing a parking lot next to the rail station qualify as transit-oriented development. 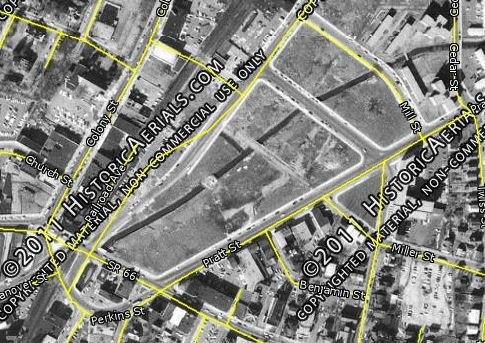 The original article, from the local newspaper, explains that the building currently standing on the site is vacant and was acquired by the state by eminent domain for the sum of $675,000, which does seem excessive for a single-story empty building in a far-from-vital ex-industrial city…but I digress. And remember: this is Meriden, which people from New Haven (where I grew up) think of as a sad sack. There’s not exactly much demand for all that surface and street parking. So why, exactly, is the state going to the expense of building a whole new lot, at the expense of mis-using a prime TOD site? My concern with Meriden’s TOD plans doesn’t, however, end there. For one thing, the new parking lot and station will mean the closing of the Brooks Avenue grade crossing at the northern end of the station site, which can be seen above. Grade-crossing elimination is a good thing, but disconnecting elements of the grid is usually a bad one. And today? 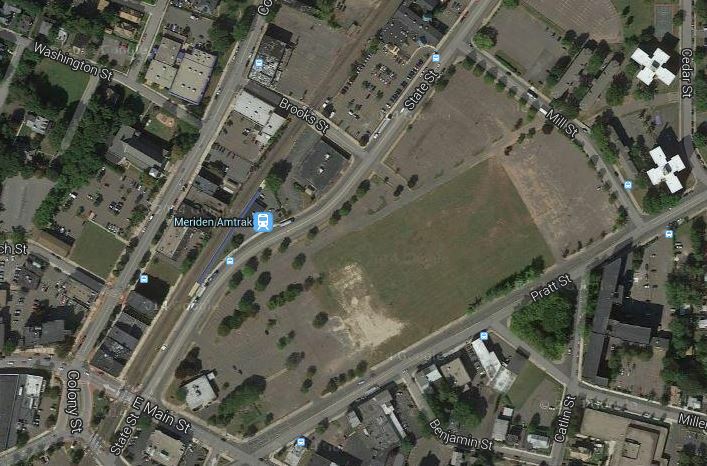 Well, the city of Meriden has a grand plan to turn the empty lot into a park. A very pretty park, to be sure, and plans including daylighting the covered-up creek that’s visible in the 1966 photos, but…come on. You have a giant piece of empty land, across the street from a train station, in an area with serious highway congestion and demand for transit access. Meriden is an easy commuter to New Haven, Hartford, or Springfield, and a several-days-a-week commute to New York City is totally feasible. Sure, the downtown has a long way to come, but every unit we don’t build in transit-adjacent areas gets built in sprawling ones. And this is a lot with potential to house hundreds, if not thousands, of people. A comprehensive, corridor-wide TOD approach recognizes this reality and stresses the crucial nature of using land near transit facilities efficiently. Building consensus among all levels of government so that city governments don’t go off-message like this is a necessity. 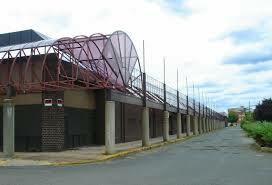 Meriden has extensive plans for other downtown TOD, but you can’t just throw away your biggest lot like this. Once it’s a park, it’s never going back. And that’s a shame, because actions like the ones showcased here, seemingly innocent decisions made to solve apparently obvious problems, have the potential to totally undermine the entire corridor’s–really the entire state’s–TOD approach. Are We Finally Getting Somewhere with Amtrak’s Boarding Procedures? Today, the Subcommittee on Railroads, Pipelines, and Hazardous Materials of the Committee on Transportation and Infrastructure of the US House of Representatives introduced a bipartisan bill called the Passenger Rail Reform and Reinvestment Act of 2014 (full text). Though unlikely to pass this year, this seems at very first glance (full disclosure, I haven’t read the whole thing) to be a creative, intriguing approach to better (or at least different) investment in Amtrak, and the Northeast Corridor especially. The major thing that caught my eye, though, is a section on, of all things, Amtrak boarding procedures. Why would the House involve itself in anything so very technical and minor? Other than the eternal explanation that Congress just loves screwing with people, the answer probably is related to the way that Amtrak’s nutty, inefficient airline-style boarding procedures (briefly: rather than having passengers wait on the platform like EVERYHWERE ELSE, Amtrak makes them queue at “gates” like in an airport) have become something of a media sensation. This prominence for a relatively obscure topic is largely due to the efforts of Matt Yglesias, first at Slate and now at Vox. Over the last several years, Yglesias has repeatedly called out Amtrak’s inefficient boarding procedures at major stations, and offered sneaky workarounds for those who feel like making an end run around security theater; others have taken up the torch as well. Amtrak, for its part, has shown little inclination to budge. SEC. 211. AMTRAK BOARDING PROCEDURES. 10 (a) REPORT.—Not later than 6 months after the date of enactment of this Act, the Amtrak Office of Inspector General shall transmit to the Committee on Transportation and Infrastructure of the House of Representatives and the Committee on Commerce, Science, and Transportation of the Senate a report that (1) evaluates Amtrak’s boarding procedures at its 10 stations through which the most people pass; (2) compares Amtrak’s boarding procedures to– (A) commuter railroad boarding procedures at stations shared with Amtrak; ( B) international intercity passenger rail boarding procedures; and (C) fixed guideway transit boarding procedures; and (3) makes recommendations, as appropriate, to improve Amtrak’s boarding procedures, including recommendations regarding the queuing of passengers and free-flow of all station-users. (b) CONSIDERATION OF RECOMMENDATIONS.—Not later than 6 months after the release of the report required under subsection (a), the Amtrak Board of Directors shall consider each recommendation provided under subsection (a)(3) for implementation across the Amtrak system. The bill’s demands might as well have been ripped from an Yglesias piece; indeed, the text hits almost all of the points of comparison that Yglesias and others have brought up with regards to Amtrak’s procedures. Perhaps some bright young staffer has been following the controversy; in any case, maybe the media pressure is getting somewhere after all. This particular bill may be unlikely to pass, but now we know the idea of boarding procedure reform is percolating in the House, and (regardless of the other qualities of this bill), maybe we’ll eventually see some progress on the issue. Boston to Albany–How Fast Can A Slow Trip Be? Expansion of east-west passenger rail service in Massachusetts has been a topic of discussion for quite a long time. Politicians from decaying industrial cities like Worcester, Springfield, and Pittsfield want a reliable connection to Boston’s vibrant economy; travelers want an alternative to the fast-if-there’s-no-traffic-but-there’s-always-traffic Mass Pike, and the state’s liberal voters tend to be more supportive than average of infrastructure projects. There’s also a good bit of nostalgia for Massachusetts’ days as the technological and political haven of American railroading. Today, there seems to be a good bit of momentum for extension of passenger service west of its current terminus at Worcester. All of the Democratic candidates for governor agree on the necessity of such service, and it given the state’s recent spree of line acquisitions for passenger service, seems likely to happen one of these decades. That seeming momentum got me thinking about the possibilities for a more thorough east-west service along CSX’ Boston Line, the former Boston & Albany division of the New York Central. Service to Springfield is one thing; getting up and over the sparsely inhabited, hilly, and curvy line across the Berkshires to reach Pittsfield and Albany is another entirely. Google Maps estimates a driving time of 2:39 from my apartment in Albany to South Station. Realistically, you have to leave 3-3.5 hours, because while the Mass Pike is fast and free-flowing from Albany well past Springfield, once you hit the interchange with 84 in Sturbridge, all bets are off. Greyhound offers direct schedules in the 3:30 range, with a stop in Worcester, but there are only a few buses per day in each direction. There are also local Greyhound buses that stop in the Berkshires towns, but they require a transfer in Springfield to get to Boston, and the trip is over 4 hours. All Greyhound buses are subject to Mass Pike delays. The less said about Amtrak’s lone train on the route, the Boston section of the Lake Shore Limited, the better; this post is about the future. But: it’s currently scheduled for 5:45 eastbound and 5:40 westbound. So there’s that. My hypothesis is that if a train could get between Boston and Albany in 3:30, it would attract high enough levels of ridership to keep it going; I’d probably ride at that time point. And of course anything faster would be a bonus. But can we get the trains going that fast? Albany to South Station is exactly 200 track miles (compared to 170 on the freeway, a major reason trains have had trouble competing in the corridor), so a 3:30 trip time corresponds to an average speed of 57 mph. On the one hand, 57 mph isn’t a particularly ambitious speed goal. On the other hand, Amtrak’s Lincoln Service, which uses predominantly flat, straight lines with stretches of 110 mph running, is scheduled for a 53 mph average speed between Chicago and St. Louis (over 284 miles), and Empire Service trains between New York and Albany are around 60 mph on average. So to achieve competitive travel times, Boston-Albany passenger trains must achieve average speeds comparable to, or even higher than, those on many of Amtrak’s higher-speed corridor services, many of which face fewer geographic obstacles. Is that doable? Let’s delve in. As mentioned above, the Boston & Albany corridor is notoriously difficult for high (ish)-speed trains. The route opened in 1841 as one of America’s first long-distance railroads; its climb over the Berkshires also claimed the title of the world’s highest railroad at the time. The routing is tortuous and twisting, following river valleys to find an acceptable grade. That being said, unlike most American railroads (at that time and for about 50 years thereafter) the line was designed to an extremely high standard. Supervising engineer George Washington Whistler (the less-famous parent of the painter) insisted on curves as gentle as possible under the circumstances and clearance of the right-of-way for double-tracking from the very beginning. 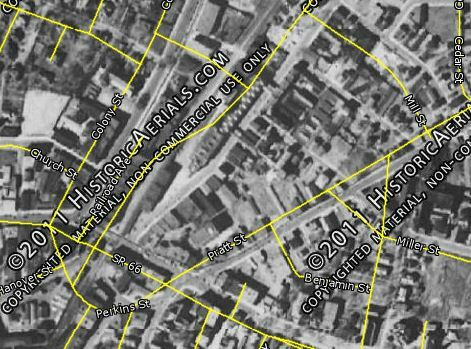 In essence, Whistler and the owners of the B&A traded more severe grades for gentler curves–the rival Fitchburg Railroad/Hoosac Tunnel route 40 miles to the north made essentially the opposite choice, with sharper curves but less severe grades. Those choices have made the B&A an operating nightmare for freight over the years, but they make it not totally hostile to passenger service, unlike the Hoosac Tunnel route. For our purposes, though, the Hoosac Tunnel isn’t the competitor; the Mass Pike is. And as I already noted, the freeway’s route, built with the advantage of mid 2oth-century technology, is 30 miles shorter than the B&A. Here, too, though, the B&A has at least one advantage. Unlike the Mass Pike, the railroad serves the downtowns of the three major Massachusetts cities along the route–Worcester, Springfield, and Pittsfield–directly. In Worcester and Springfield, freeway spurs lead to downtown, so the distance of the Pike isn’t a big deal, but Pittsfield has no direct freeway access and is a good 20-minute drive off the Pike. The lack of immediate freeway access also means that buses cannot serve the Boston-Albany corridor in a linear manner. That’s why Greyhound doesn’t run buses between Boston and Albany with stops in Worcester, Springfield, and Pittsfield: the repeated backtracking to the Pike would make it an unacceptably long trip. Additionally, these cities are essentially the only feasible stops on a Boston-Albany service, and they fall nicely into an every-50-miles pattern: Pittsfield is 49 track-miles from Albany, Pittsfield-Springfield is 53 miles, Springfield-Worcester 54, and Worcester-South Station 44. The Lake Shore Limited makes an additional stop at Framingham, halfway between Worcester and Boston; that stop could probably eliminated with a timed transfer to/from a local commuter rail train at Worcester. The only other possible stops that I can imagine are Palmer, MA and Chatham, NY, but neither really warrants a stop on an intercity train. This is abnormally few intermediate stops for an Amtrak corridor service, which typically stop every 20-30 miles. The less-frequent stops might–might–help trains maintain a higher average speed, even if top speeds aren’t all that great. But just how fast can we get the trains going? I know I promised not to speak much of the Boston section of the Lake Shore Limited, but its current schedule is the place to start. One thing is immediately clear: this schedule is massively padded in both directions. If, following my division of the line into four segments (Albany-Pittsfield, Pittsfield-Springfield, Springfield-Worcester, and Worcester-South Station), we look at the two terminal segments, we can see the insertion of the padding. Boston–Worcester is scheduled for 1:03 outbound (westbound)–and 2:13 inbound (eastbound). Likewise, Albany-Pittsfield is scheduled for 1:04 eastbound, but 1:59 westbound. If we eliminate the massive padding, we can immediately cut a little over an hour off of the Lake Shore‘s scheduled time, cutting it to a still-uninspiring (and non-competitive) 4:45 or so in each direction. Of course, the padding in the current schedule exists for a reason; the Lake Shore‘s on-time performance is notoriously horrific, earning it the nickname Late Shore Limited. Any scenario that envisions increased passenger traffic will certainly involve re-installing double track along the entire B&A corridor (not a problem in terms of ROW), with the state paying in return for absolute passenger dispatching priority. Planned track improvements now that the state owns the Worcester Line between South Station and Worcester should cut another 15 minutes or so off of travel time, leaving us with a nice, round time of 4:30–still an hour slower than might be considered competitive. One way to improve travel times is by increasing track maintenance to levels that will allow higher speeds. Currently, MBTA is struggling to boost its portion of the Worcester Line from FRA Class III (6o mph for passenger) to Class IV (80 mph for passenger) standards; but more can certainly be done. Most of the rest of the line seems to be maintained to Class III standards, but the ingredients exist for converting it to allow for higher passenger speeds: the entire line west of Framingham is signalled with (antiquated, but upgradeable) cab signals, and there are relatively few grade crossings due to the age of the line. That being said, upgrading absolute train speeds will have relatively little effect because of the line’s severe curvature; with the exception of the more-or-less tangent 20-mile Palmer-Springfield segment, the limiting factor on train speeds is generally curvature, not track or ballast structure. Certainly, building the theorized second track to Class IV or V (V requires cab signals, but luckily the Boston Line has them) would help, but is there a better way to boost average, rather than absolute, top train speeds? For the answer to that question, we can turn to the opposite coast, where for the last decade and a half Amtrak has been happily operating tilting Talgo trainsets on behalf of the states of Washington and Oregon on the Cascades. These Spanish-designed trainsets are lightweight (though not as lightweight as they could be, thanks to FRA regulations) and their tilt mechanism allows them to navigate curves faster than conventional trains. Various factors–expense, Talgo’s insistence on doing maintenance itself, mechanical discontinuity with other fleets, lower capacity–have kept the Talgos from being adopted more widely in this country, but they’re a very, very strong fit for a curvy, hilly route like the Boston & Albany. The criteria for their ability to save time are complex, but as this Trains Magazine explainer puts it: “Tilting reduces trip time only when the route has a reasonable concentration of curves with curve speeds between 50 and 80 mph. In this speed range, a Talgo-type train will be able to negotiate a curve at speeds 5-10 mph faster than conventional cars. Generally, tilting does not generate significant time savings unless the curve density on a route is 30 percent or higher.” This description could be written for the B&A. There are virtually no tangents of any significant length, but relatively few of the curves are so sharp that they necessarily drop the speed of the train below 50 mph. Equipping corridor trains on a Boston-Albany route with Talgo trainsets could do a lot to boost average speeds–but how much? The current Cascades schedule shows Talgo-equipped trains saving only about 10 minutes over the Superliner-equipped Pacific Starlight, but that’s a product of ongoing summer trackwork. Historically, Talgo schedules have saved 35 to 45 minutes, or about 15%, on the 187-mile Seattle–Portland segment, which is actually less curvy than the B&A (Talgos save little to no time on the very straight segments between Portland and Eugene, and only some north of Seattle). Knocking 15% off of the theorized 4:30 unpadded Lake Shore Limited time would give us a time of 3:50 or so, getting closer to our goal but not quite there yet, and still over an hour longer than a direct Boston-Albany bus. However, as mentioned the Portland-Seattle segment isn’t actually that comparable to the B&A, being less curvy and with lower potential maximum speeds because of the lack of cab signals. And sure, there is no other modern experience with Talgo operations in the US. A theoretical application of Talgo equipment, though, is perhaps the next-best thing, and that’s what we find in Pennsylvania. Found via this Sic Transit Philadelphia post, Samuel Walker of Test Plant managed to get a Talgo engineer’s estimate of time savings from using their equipment on the old Pennsylvania Railroad mainline between Harrisburg and Pittsburgh, a route that in age and alignment is very comparable to the B&A. By the engineer’s calculation, Talgo equipment could cut the 254-mile Harrisburg-Pittsburgh run from 5:30 to 4:10, or from 4:56 to 3:36 if the 34-minute schedule pad is eliminated. That’s a savings of 25% before padding and 28% after. If we cut 25% off of the paddingless 4:30 Boston-Albany running time…we get a time of 202.5 minutes, or 3:22.5–just below the magical (to me!) 3:30 time cutoff. Again, that’s with nothing assumed as to track quality other than the already planned upgrades inside Worcester and the installation of a second track built to Class IV speeds west of Worcester. Of course, those upgrades are far from nothing–probably on the order of hundreds of millions, if not multiple billions, of dollars. But if Massachusetts can find the money for a second track and signal upgrades along the B&A and if state politicians are willing to negotiate hard with CSX over dispatching priority and if Amtrak or the state are willing to take a risk on Talgo equipment and if the Talgos prove able to do for the B&A what they could do for Pennsylvania…I see no particular reason that a functional Boston-Albany service couldn’t be established in relatively short order. A time of 3:22 end-to-end isn’t magical, but given that a train would be able to hit Pittsfield, Springfield, and Worcester within that time frame. And while a full 3:22 might be at the high end of the time savings that Talgo can offer, even if the time savings are more in the Cascades range of 15% a combination of new equipment and more extensive track upgrades should be able to get travel times down into the 3:30 range. That’s certainly better than any bus can do while stop at all three intermediate cities. So I do think a renewed, relatively fast Boston-Albany service is possible. It would require significant investment, but it seems to be doable. The main advantage of a train over buses is that one service will be able to stop at all of the major cities in the corridor. Potentially, such a service could become the backbone of a frequent intercity rail network serving the entire state, with the Boston-Albany trains making connections at Springfield and Pittsfield to DMU services in the Pioneer Valley and Berkshires. That’s far, far in the future, but it would be an enormous mobility “win” for the entire state. 1. One particular challenge for the introduction of Talgo equipment to the line might be the presence of high-level platforms. There’s no question that the next-generation trains on the line will be built for high-levels; South Station, Back Bay, Worcester, and Albany have full high-level platforms and Springfield is getting them as part of the NHHS project, not to mention that Amtrak is going to an all-high-levels policy in the Northeast. Of current intermediate stops, that leaves only Framingham and Pittsfield. In Pittsfield, building a side track for a high-level platform so as to maintain freight clearances shouldn’t be too hard. Framingham is a little more of a challenge; it currently has mini-highs and will still be on a freight clearance route, which perhaps further militates for not stopping there. That being said, Talgos are low-slung and there are no examples of high-level-platform-equipped ones operating in the US, so that might increase costs some. 2. One of the problems with the current setup on the Worcester Line is that, while there are three tracks in segments, much of the ROW was cut down to two tracks from Newton in to accommodate the Mass Pike. There are, further, very few sets of crossovers. One of these things can be remedied; the other realistically cannot. More crossovers it is (this will help MBTA trains more than intercity service!). 3. CSX may not love the idea of ceding half of their ROW for a second track to be committed mostly to passenger trains, but it’s not like Massachusetts doesn’t have leverage. The state has already paid for full double-stack clearance, and along with that carrot can hold out the stick of capital investment in helping the Pan Am Southern Alliance clear the Hoosac Tunnel route for higher speeds and double-stacks. CSX doesn’t want to lose its huge advantage in the Boston market; the state shouldn’t be afraid to play hardball, perhaps even asking CSX to pick up some of the tab for the second track.